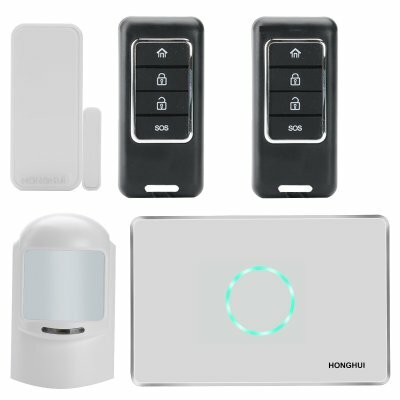 Successfully Added Home Security Alarm System - GSM, SMS Notifications, PIR Sensor, Wireless Door Sensor, Wireless Remote Control, Two-Way Audio to your Shopping Cart. Keep your home safe and sound with a comprehensive security system that will send timely notifications to your smartphone should any suspicious activities be detected. Having the peace of mind when it comes to your personal security and that of your loved ones is an important ingredient to a happy life. Make sure your home is well-protected at all times, whether you are there or away, with a smart home security system. The smart anti-burglar system comes with a PIR motion detector, door and window sensor, an easy-to-use control panel, a remote control and all the accessories you need to set it all up. Thanks to the support of the 4 frequency GSM network (850/900/1800/1900/MHZ), the system can send text messages right to your smartphone if it detects a problem. It also comes with a110db built-in siren for powerful sound alerts to warn you and your neighbors of suspicious activity. The PIR motion sensor is able to detect motion within 8 meters and covers a transmitting range of 80 meters. The door/window sensor is easily fitted onto your main door and windows or can also be used with safes, cabinets or other places where valuables are stored. You can also use it too keep pets from getting into or out of the house when you are away. This smart security system will let you know when it’s running low on power and also comes with a 1000mAh built-in backup battery and will keep working even when there is no direct AC power supply - for instance, in the event of a blackout. The Home Security Alarm System comes with a 12 months warranty, brought to you by the leader in electronic devices as well as wholesale smart home security alarm systems..